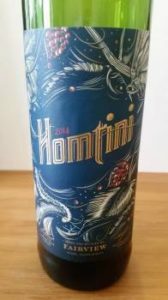 Homtini used to be the name of Fairview winemaker Anthony de Jager’s own-label Shiraz-Viognier but now designates an entirely different wine. De Jager suggest that current-release Homtini 2014 be viewed as a “Super Darling”, the wine taking its cue from the Super Tuscans of Italy and leading with 41% Sangiovese from Fairview’s Darling vineyards plus 36% Cabernet Sauvignon, 14% Shiraz and 9% Merlot. It’s engagingly exotic showing red fruit, vanilla and spice but also a more delicate floral note with time in glass. The palate meanwhile is properly vinous, which is to say displays good fruit concentration, bright acidity and fine tannins – really well put together. Price: R125 a bottle.